Have you pulled up your carpet to find stunning, yet tired wooden flooring beneath? Perhaps you’ve recently purchased a property with wooden floors that have seen better days? The older your property, the more likely it is that you have high-quality hardwood flooring that has hidden potential. Beautiful hardwood floors were installed in homes across Australia and often never seen because carpet or vinyl would be placed on top straight away. This trend came to prominence in the 1950s and lasted through until the 1980s. Fortunately, designers and homeowners since the 1990s have realised the durability and beauty of hardwood floors and have begun to restore them. D.R Main Floors accomplishes wonderful floor transformations across Brisbane and has recently completed the floor restoration in a very old building on Wickham Terrace. This building has stunning Crows Ash floors, which is a large hardwood species that is native to Northern NSW and parts of Queensland. Crows Ash is also commonly known as Australian Teak. Crows Ash is in limited supply and is widely sought after for its durable quality as flooring and its lighter appearance with rich golden tones. After carefully sanding back the wooden floors, D.R Main Floors then finished in Bona Kemi Traffic Satin Water base, which produced the wonderful look seen below. If you have wooden floors that haven’t reached their potential yet, contact our friendly D.R Main Floors team. We provide free quotes and take great pride in our work, as seen above with our work at Wickham Terrace. 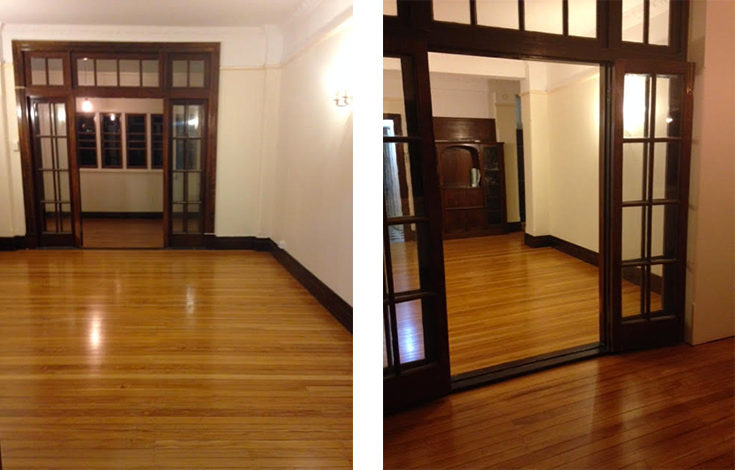 Let us transform your tired hardwood floors into a stunning feature of your house.